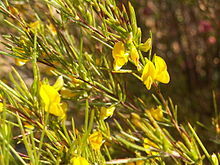 Rooibos (Afrikaans for "red bush"; scientific name Aspalathus linearis) is a member of the legume family of plants. Rooibos teas are herbal infusions made from a South African red bush. There are also green Rooibos teas. ↑ Morton, Julia F. (1983). "Rooibos tea,aspalathus linearis, a caffeineless, low-tannin beverage". Economic Botany 37 (2): 164–73. doi:10.1007/BF02858780. ↑ Krafczyk, Nicole; Woyand, Franziska; Glomb, Marcus A. (2009). "Structure-antioxidant relationship of flavonoids from fermented rooibos". Molecular Nutrition & Food Research 53 (5): 635–42. doi:10.1002/mnfr.200800117. PMID 19156714. ↑ Theunissen, Izelle (March 2005). "Rooibos the healthy tea". Science in Africa. This page was last changed on 8 March 2019, at 12:36.